1. Heat stock in a saucepan on medium heat until almost simmering. Reduce heat to low. 2. Heat 1 tbsp of oil in a large heavy based pan over medium heat. Add leek and cook for about 2 minutes or until soft. Add the rice and stir until well coated with oil. 3. Add a ladleful of the heated stock, stirring until the liquid is almost absorbed. Continue the process, adding a ladleful of stock at a time until all the stock has been added and the rice is just cooked. This should take about 15-20 minutes. Place lid on risotto, and set aside. 4. Heat 1 tbsp oil in a frying pan over high heat. Add the prawns and cook for about 2 minutes, turning once until just cooked. Add wine and cook for 1 minute or until wine has reduced by 1/2. Add cherry tomatoes, basil and cream and cook for 2-3 minutes or until the cream has thickened slightly. 5. 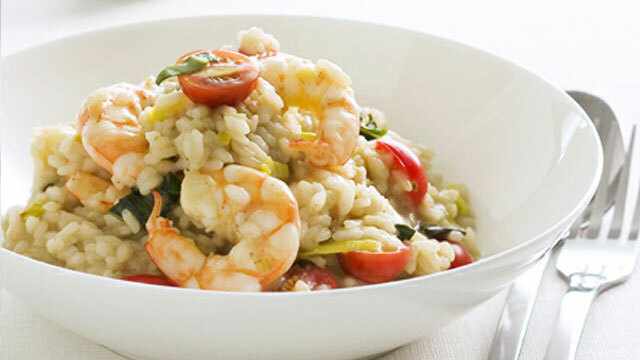 Gently stir the prawn mixture into the risotto. Garnish with extra basil leaves if desired. This entry was posted on September 13, 2010 at 8:08 pm and is filed under Cooking, Family, Friends, People, Random, Recipe. You can follow any responses to this entry through the RSS 2.0 feed. You can leave a response, or trackback from your own site. Looks like a delightful meal…by the way, I prepared your Calamari with Roasted Tomatoes the other night…was received by all as marvelous…thanks! Looks SOoooooo scrumptious! I want some. I want someone to cook it for me! Hmm. Yummy. Thank you for the recipe. I will dream of this risotto for sure. It’s not too hard to do! I just may try it. Thank you for sharing this easy but wonderful recipe. Blessings to you, Amanda! Either I’m losing my comments or I’m losing my mind (a distinct possibility). Now I rmember reading this one, but I don’t see my comment, which was that I like the combo of rice, tomatoes, and shrimp. Maybe I’m moving off the page before the comment posts. Anyway, Amanda dear, another goody. Love it … shimp looks big, plump, fresh. Nice!